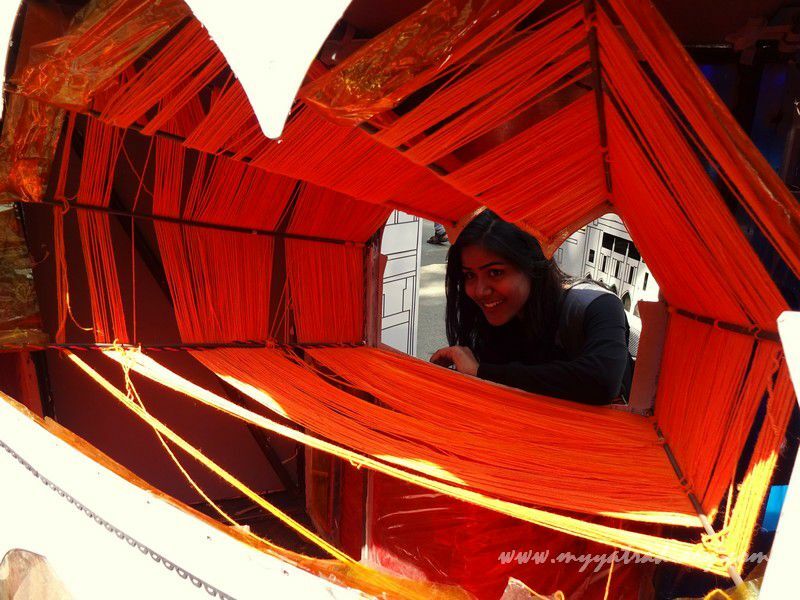 Visual Installations At Kala Ghoda Arts Fest, Mumbai: Rampart Row. If you’re to choose to paint your life today... What will it be? Remember, you’re the artist, not the canvas. While the Kumbh Mela in Prayagraj, Uttar Pradesh continues to pick steam, closer home Aamchi Mumbai just concluded celebrating its own version of Kumbh, albeit of a different kind! 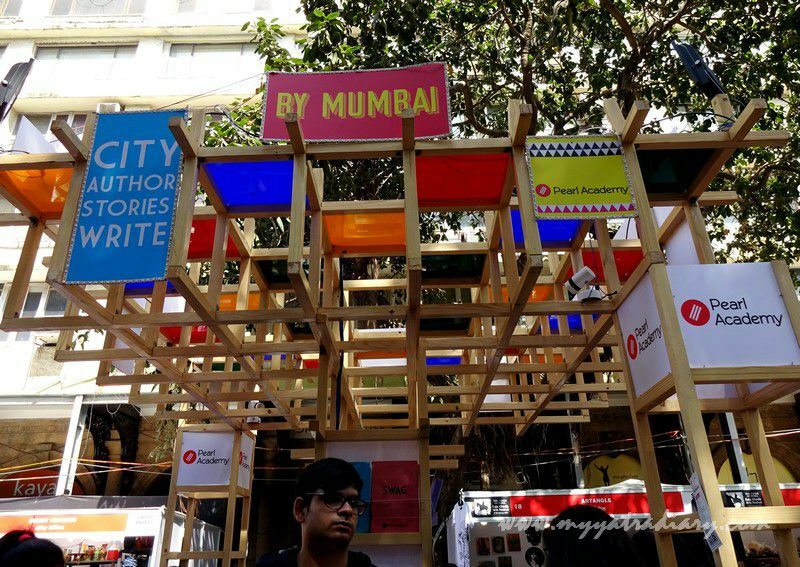 The annual nine day long Kala Ghoda Arts Fest was underway in the maximum city, the biggest cultural extravaganza held every February, from the first Saturday till the second Sunday of the month, in the Kala Ghoda Fort area of South Mumbai in Maharashtra. 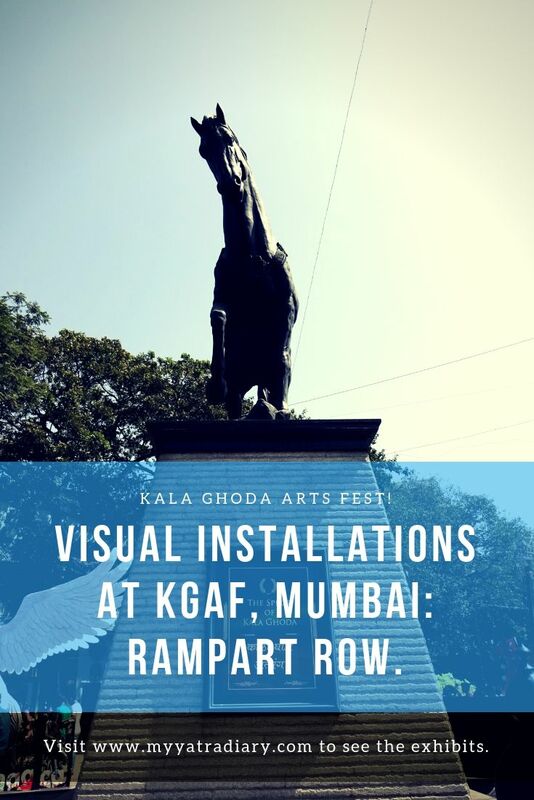 This year, the Kala Ghoda Arts Festival was celebrating its 20th anniversary as well as the 150th birth anniversary of Mahatma Gandhi. Keeping up with the 2 decade long anniversary celebrations, the theme this year was ‘A Measure of Time’ - a perception of the last 20 years – a continuous progression in which all changes have taken place suggesting that within the space-time-continuum, all statements are relative, depending on the observer. Incidentally, it’s my first time at the festival – the only other time I have been here was a couple of years back when I had given it a miss after seeing a huge queue at the entrance itself. Not this time though as this year, I am determined to discover my share of all the buzz that Kala Ghoda festival garners in Mumbai. After alighting at Churchgate station, there are free bus services that ply from the SNDT college to the Kala Ghoda fest but I decide to walk all the way. The Charkha: Spinning wheel, popularized by Mahatma Gandhi and regarded as a symbol of self reliance and Indian Independence. The spiral trajectory of the dynamic exhibit captures India's unbounded spirit in timeless values such as unity in diversity, tolerance, and self reliance which are the essence of India. for all may find their cloud of diamonds is my desire. 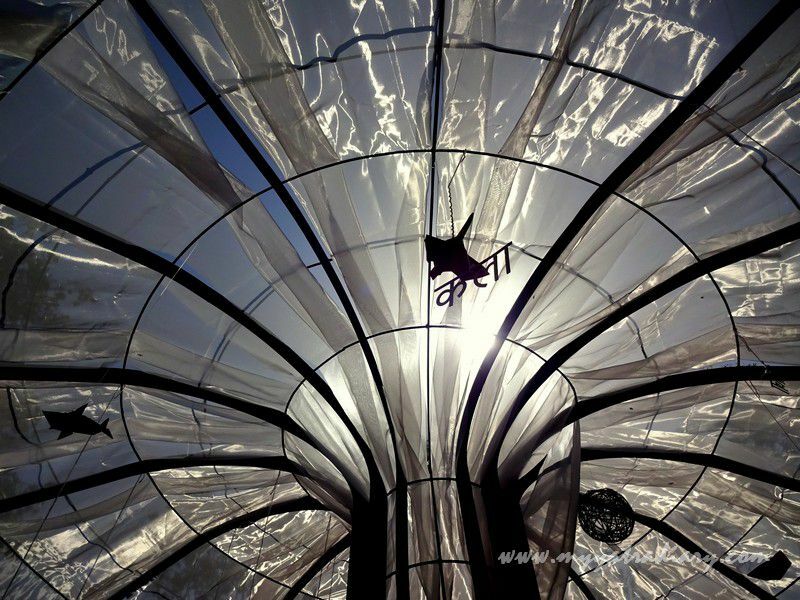 Perspectives of Time: Have you ever wished you had more time to pursue something you love? Or perhaps, a regret of missing out on something because of lack of time? than pursuing a hundred things that continue to leave us unhappy. 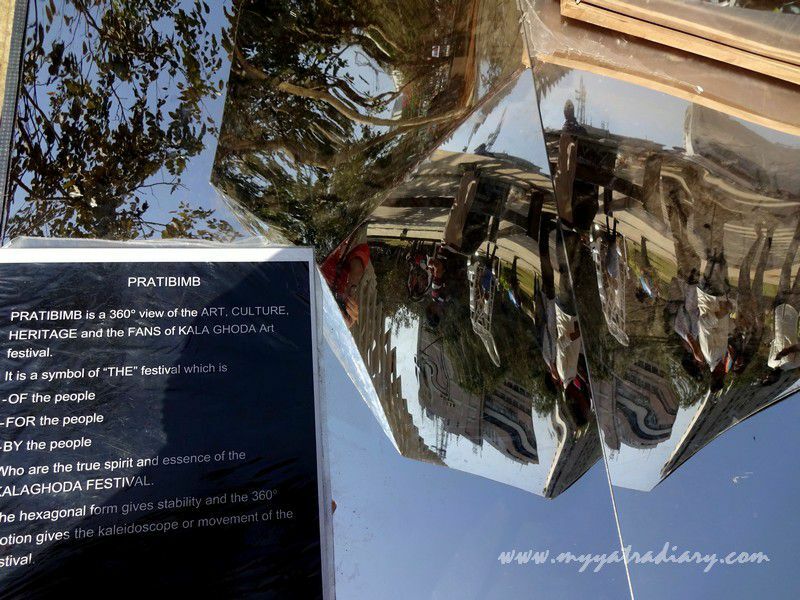 Pratibimb: A 360 degree panoramic view capturing 'THE' true spirit festival. 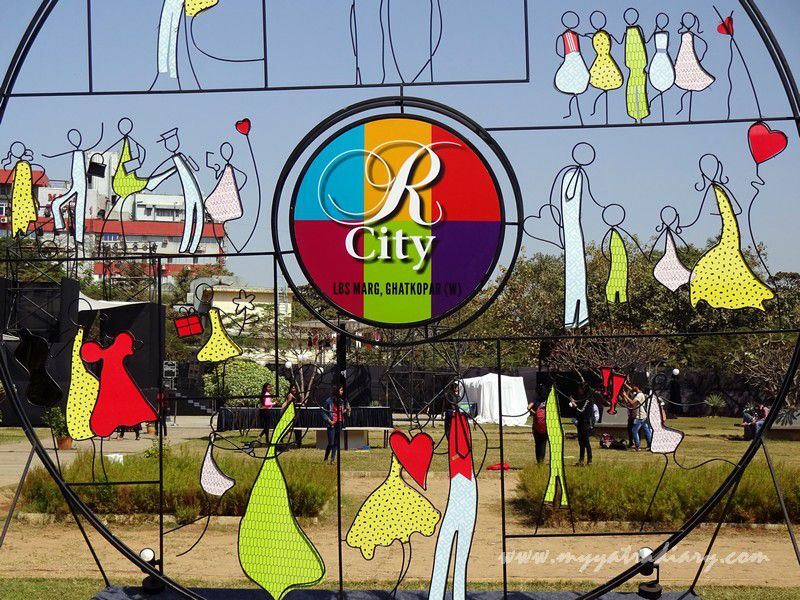 R-CITY: THE CITY OF INDULGENCE. a city where there is something amazing for everyone. Till the Last Lead: Mahatma Gandhi would use his pencils till the last lead as he believed in making the best of everything wasting as little as possible. 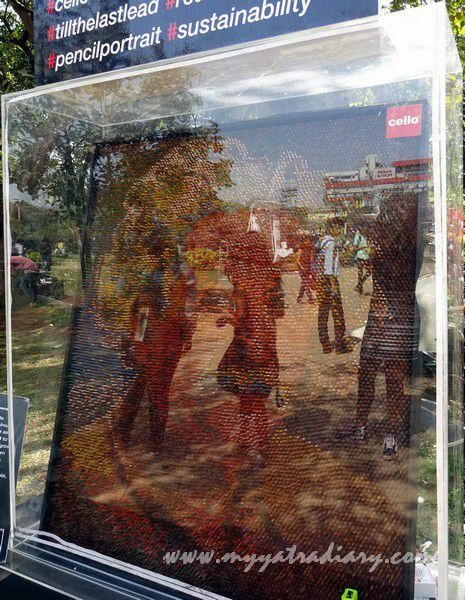 In an age where we are used to a life of abundance, this exhibit seeks to change the attitude by creating this intricate 3D installation of a famous scientist from pencils that have grown short in length. Can you see who the scientist is, in the picture? 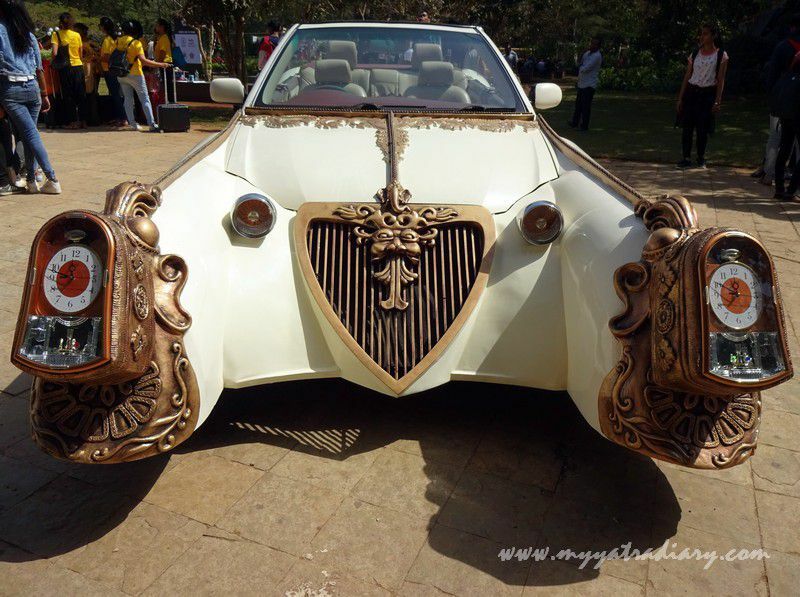 Sapno Ki Sawari: A vintage car to make the most memorable entry for the bride and the groom. disappearing at an alarming rate - one of the major culprits being mobile radiation. 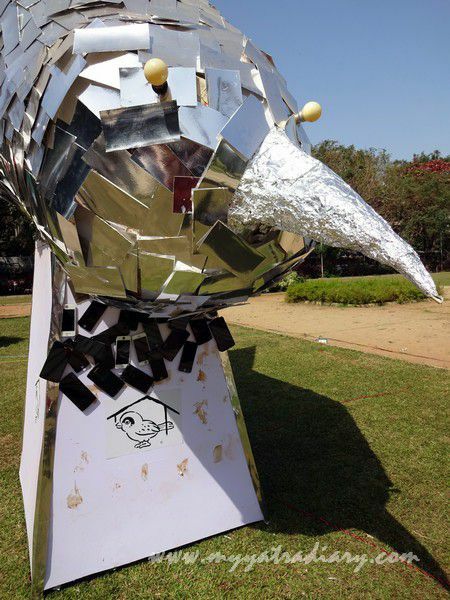 It further attempts to increase awareness about setting up sparrow shelters in Mega cities like Mumbai. without any prejudice or sexual bias. 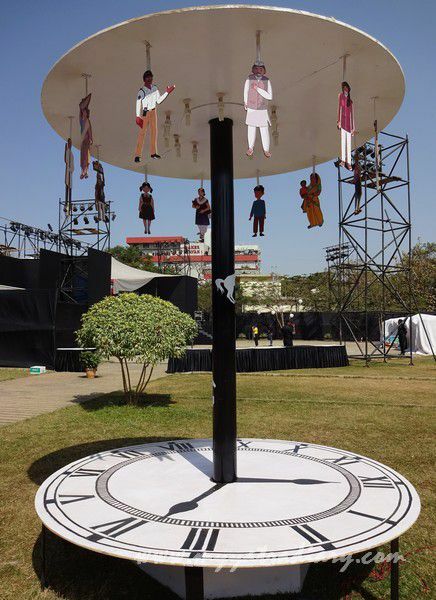 A powerful installation calling for a mental revolution. 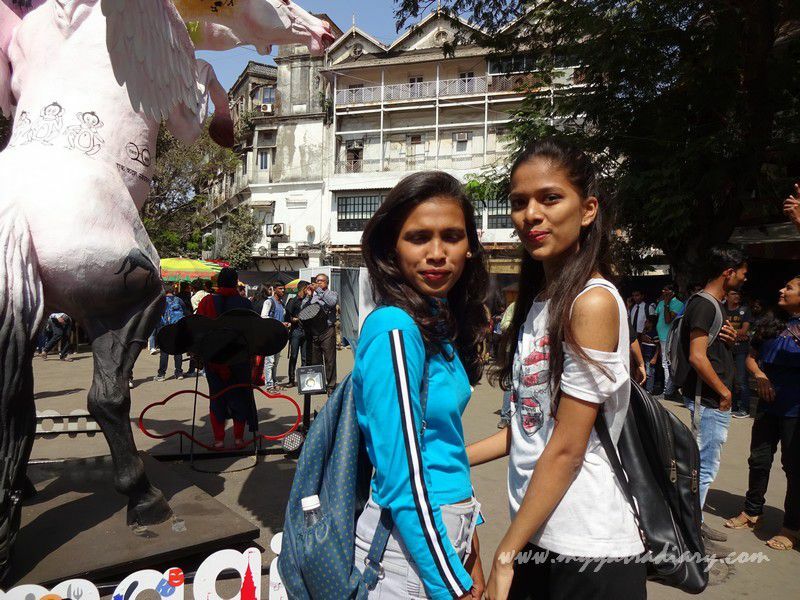 Making my way forward from the Cross Maidan, I bump into these two lovely girls at the flora fountain as I am trying to figure out my way to the Kala Ghoda fest, turns out (to my delight) they are doing the same – warm, cheerful and friendly, they happily let me tag along, and together we reach the fest to indulge in our curiosities. Riya on the left and Geetanjali on the right - lovely girls I met on the way. There is a large queue at the entrance which takes around 20 minutes to move past through to the security check and into the wide open space of Rampart row, the main Kala Ghoda Street (K Dubash Marg). Stepping suddenly in the vast sea of people inside, there is a vague sense of losing a part of myself to something which is more powerful, more bigger than what I otherwise imagine myself to be. Do I desist it then? These crowds?! People from all walks of life converge at the cultural fest. No. 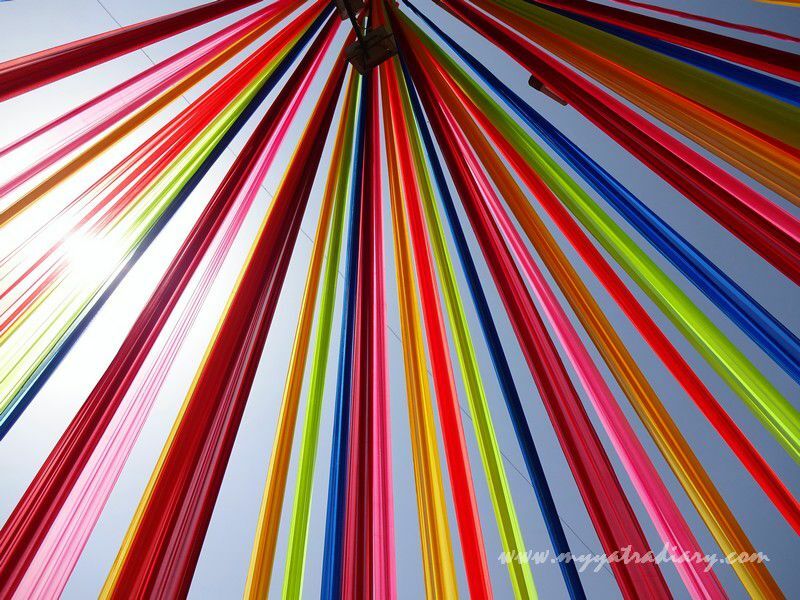 Not at all, in fact, on the contrary, I feel more active as I continue on my expedition to discover the myriad colors of this unique festival. 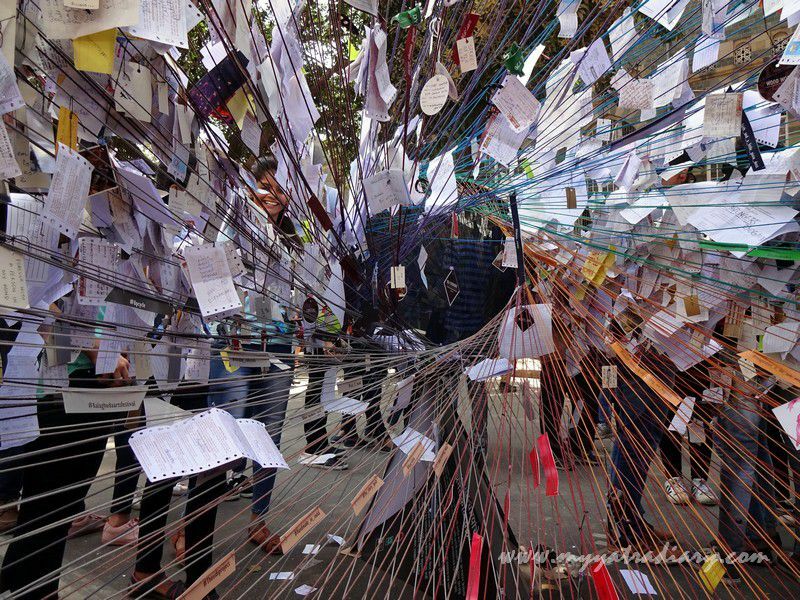 Maybe it’s the power of the vibe of so many people, from different walks of life, coming together in a single purpose, as one, like the many colorful threads hanging over my head, that converge in a spirit of joy, and creativity at the galloping, graceful Kala Ghoda. The ubiquitous Kala Ghoda pulling the reins of time! Lined up at the periphery inside are stalls selling distinct items that include clothes, jewelry, toiletries, stationary, books, slippers, bags, pots and paintings, trinkets, etc. mirroring the unique hand crafted flavors showcased from different states all over the world. 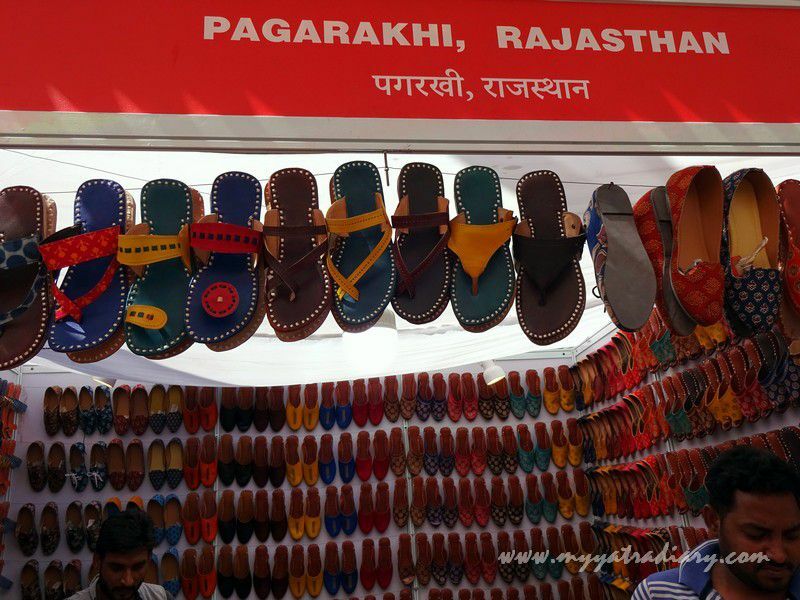 It’s a delight to walk past all these stalls as most of the products here are made and sold by village artisans bringing with them a distinct traditional touch. 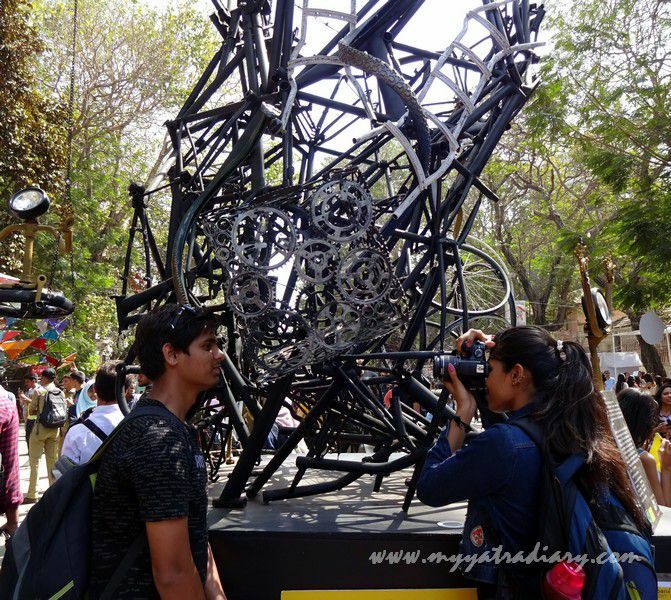 The rest of the ground is an open museum – a fine meeting ground for artists and art enthusiasts in an endeavor to make art accessible to everyone and to peddle thoughtful musings and meaningful conversions around them. 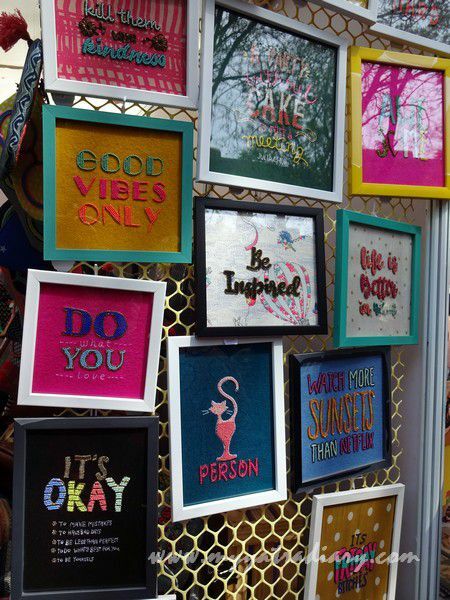 So join me, let’s take a dip at all the visual explosion that is the Kala Ghoda Arts Fest and see exactly which exhibits touch the chords of our mind and burst our hearts open! Come along!! In 1966, India lost one of its greatest prime ministers. For his wife, the loss was even greater. After the death of Lal Bahadur Shastri, Lalita Shastri was left with nothing more than the monthly government pension to run her house. Even so, she paid back every penny of a car that was taken by her husband before his death. Fearless, and resilient, Lalita Shastri never let the color of her commitment fade. In fighting the toughest odds and challenges, she truly embodied the crimson of her Kumkum. 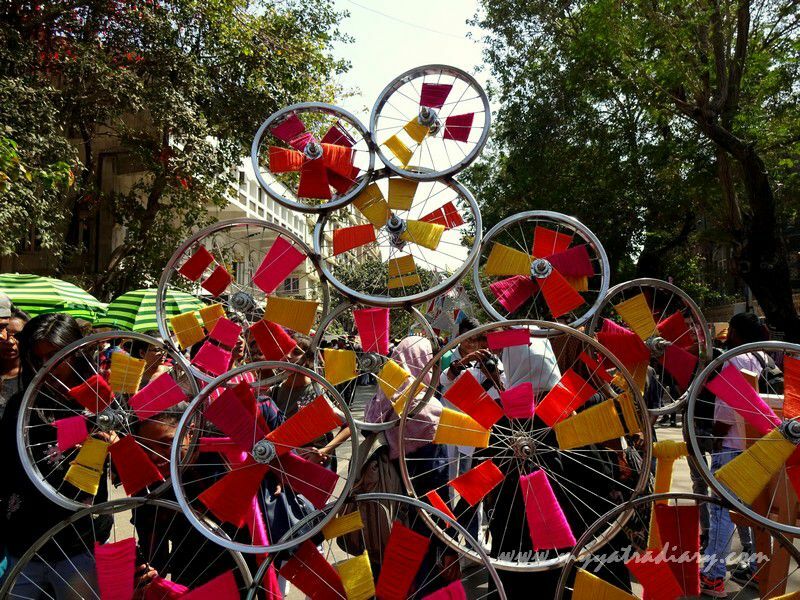 The Wheels take the audience forward as the glory of the past and present of the Kala Ghoda Arts Festival is weaved together in a continuum. 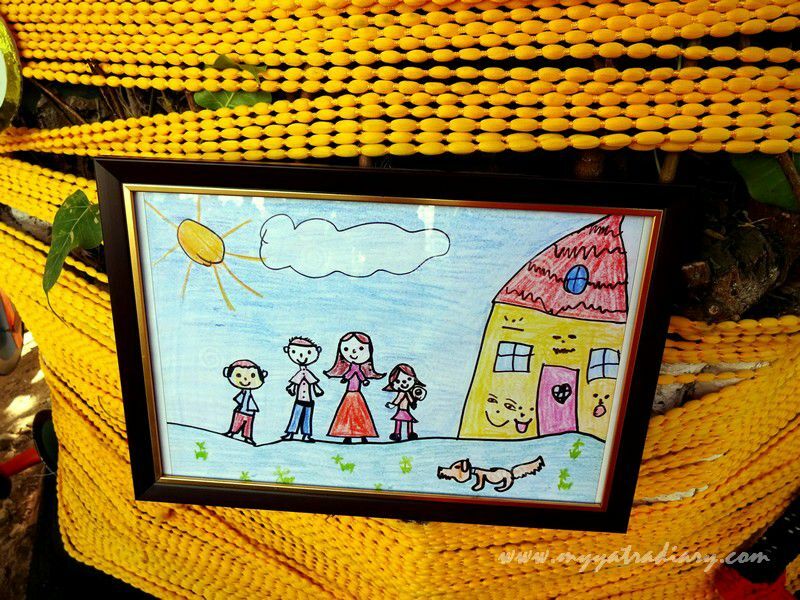 Encourages a play filled childhood ensuring a bright future. so next time don't forget to look up while you're riding in a kaali peeli in Mumbai! Where everyday is an episode, why not think about a book where every page is a story? thus bringing the city to life. encompassing the past, present and the future. 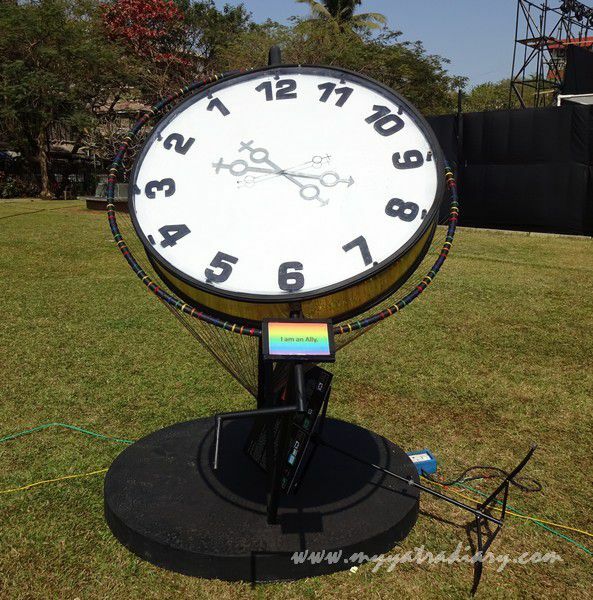 KALANTAR - TIME TRAVEL (SAMAY YATRA). Have you ever wondered... time travels too? 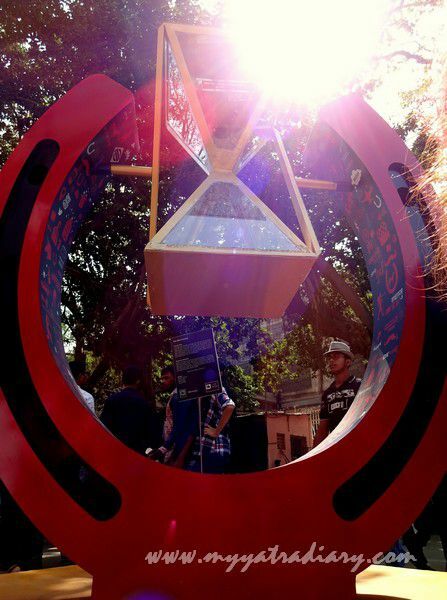 This hourglass as a measurement of time is proof of time travel. 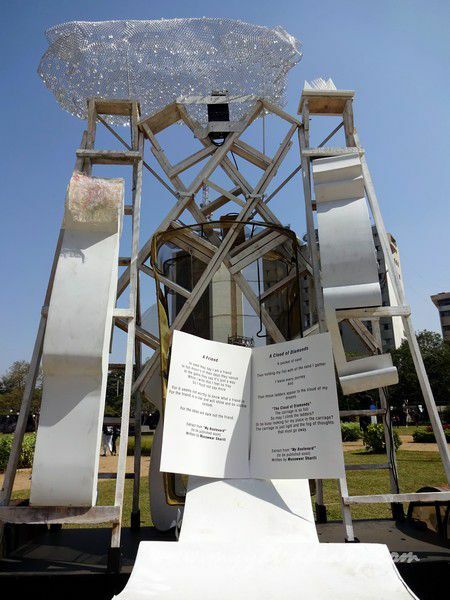 TOUCH THE ART: The interactive installation conceptualised from the quality of three structures – Jehangir Art Gallery, David Sassoon Library and Rhythm House; throws open the doors to every person as an artist under one roof depicting the platform that Kala Ghoda provides to the artists. A wish fulfilling tree... it depicted the dark realities of life like child labour and early marriages. Further inquiring us if we are doing our bit? 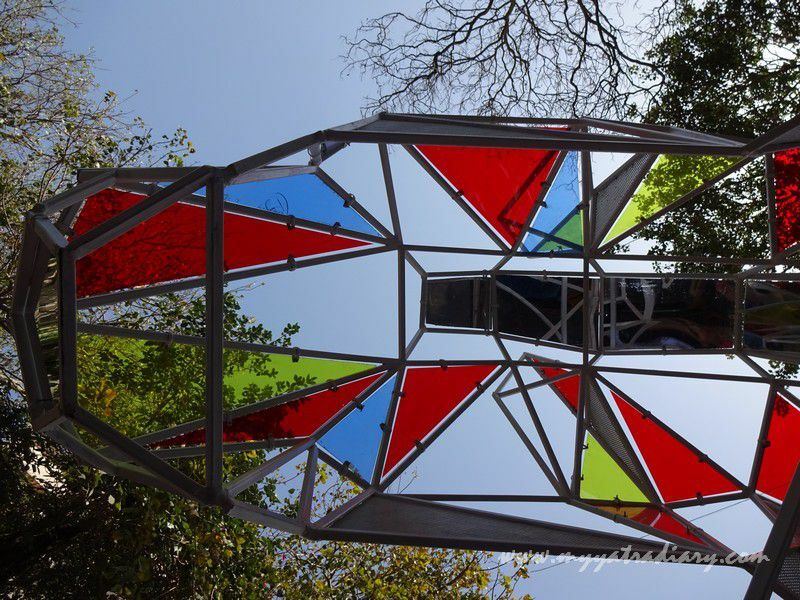 An interactive installation, with stained glass and mirrors - it attracted a lot of crowds encapsulating colorful memories at KGAF. 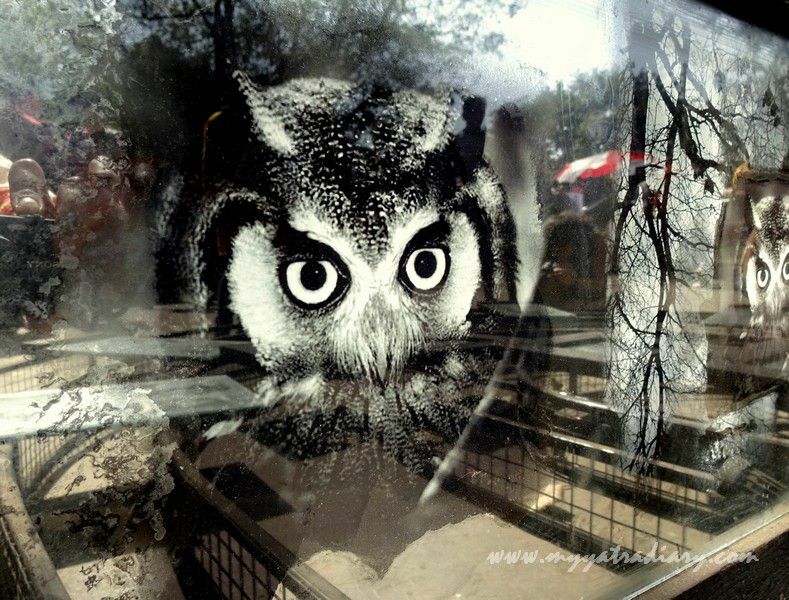 REFLECTION OF TIME ON ART. with a fusion of European decoupage art. Celebrating the colors of cinema - this was indeed one happy place. The symbol of luck and good fortune. It’s close to 2.5 hours of ambling around making my through the melee, when I reach the other end of the Kala Ghoda Arts Fest, the exit. Before stepping out and bidding goodbye to the festival, I pause... reflecting back, just for a moment. And, all my eyes can see are colors... all unique and yet working well together. and making this festival such a vibrant and vivacious kaleidoscope of art and culture. 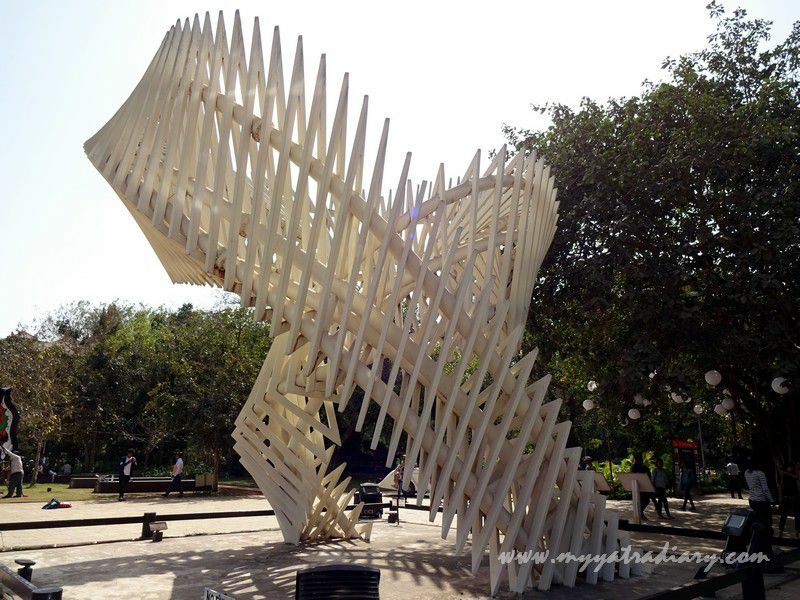 I leave the grounds with a silent hope, to be back to attend the Kala Ghoda Arts Fest again next year. 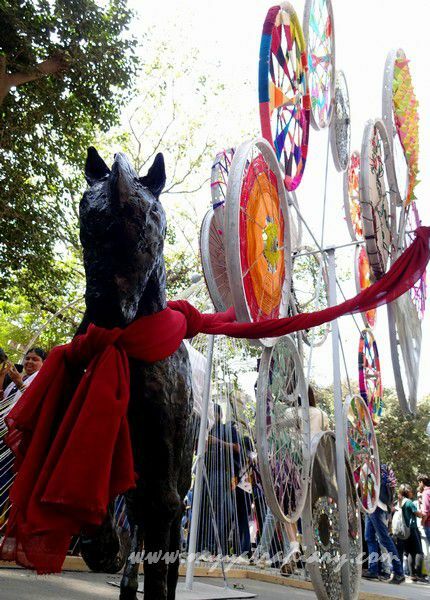 Kala Ghoda Arts Fest is an annual festival held in the month of February for nine days. How to reach Kala Ghoda? 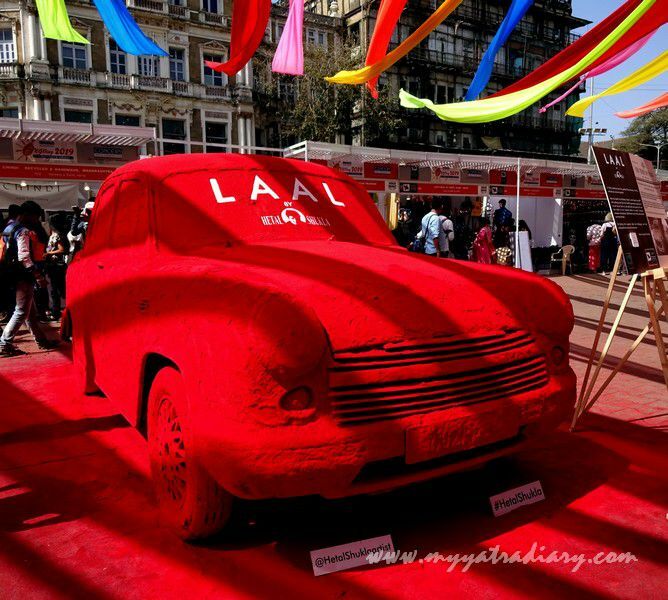 Kala Ghoda Arts Fest is accessible from CST and Churchgate railway stations. From Churchgate, buses and taxis are easily available. But I would suggest to go walking if possible, it takes around 15-20 minutes on foot. 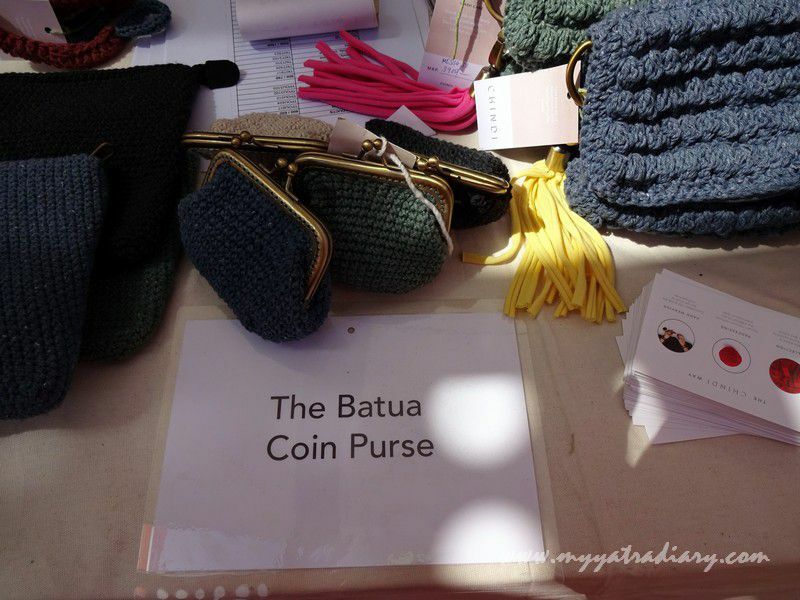 Is there an entry fee to attend the events at Kala Ghoda? 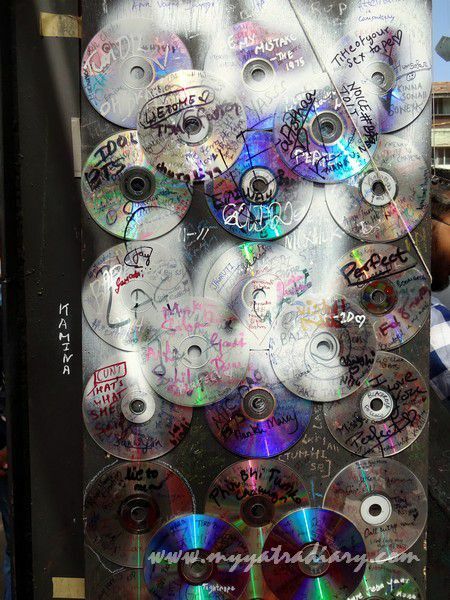 Kala Ghoda is a free entry, public street art event where anyone can attend any part of the festival without any fees. Where can I find the complete schedule for all the events? There are lot many events at the fest besides the visual installations - for complete information, check their official website for more details. Liked reading the post? PIN IT! A beautiful narration of your experiences, Arti. Indeed, trying to see the world the way artists do just opens our minds to so many horizons. 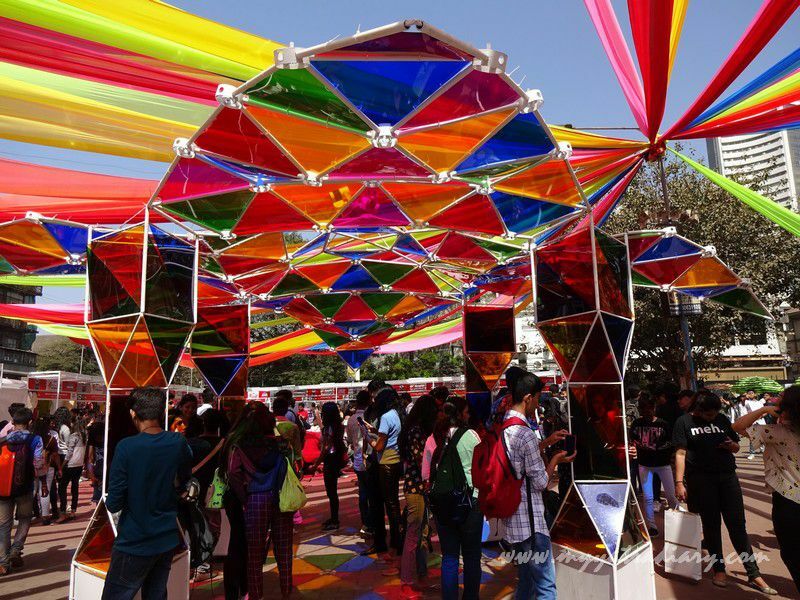 The way KGAF was bathed in color (not just from the installations but even the reflections of light on the glass) left quite an impression on me. But I just couldn't see it as intricately and as deeply as you did. Wow! Looks like a great fest satisfying varying interests! You sure had a great time. Vibrant and colourful! Glad to have taken your virtual tour! 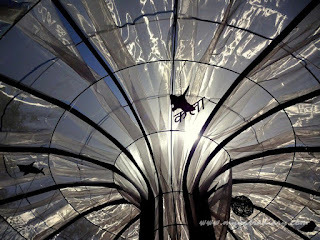 Beautiful photography of these creative works, enjoyed the virtual tour. Awesome read. Just loved the post. 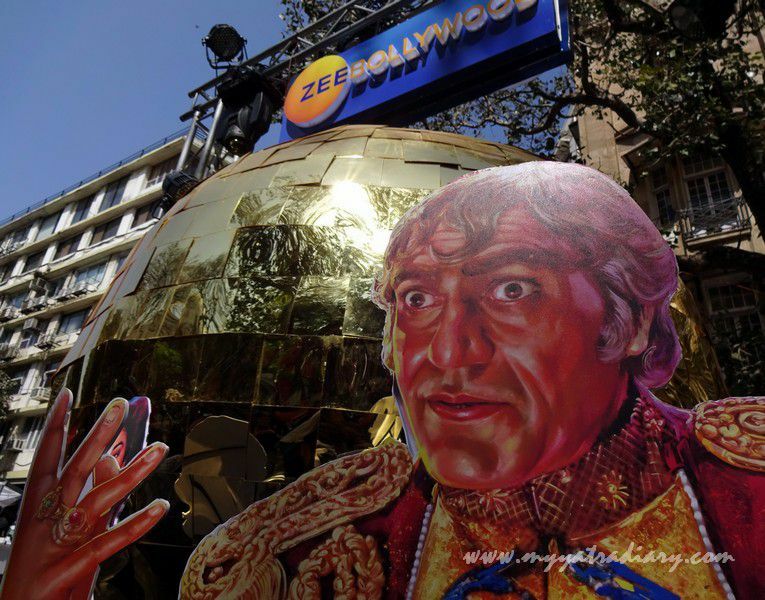 Awesome pics from Kala Ghoda Arts Fest. My mind is whirling with all the installations and their meanings. I tried Google to discover the scientist, but came up blank (though there were many photos of Indian women scientists) - it is a woman, isn't it? I'm glad you braved the crowds so I can enjoy the photos. So many colors and shapes - it's certainly an impressive exhibit. Thanks everyone for hopping by, I am so glad you'll liked the post - it was a wonderful experience indeed! @Deepa: I just googled Muziris Biennale to know more about it. Sounds exciting! I would so love to see all the art works there someday and hopefully cross paths with a great artist like you too!! @Barb: No Barb, it's not a woman - It's Einstein! Made entirely in shortened pencil leads - can you figure him now? Thanks much for your comment, always such a delight to read you and hear from you. 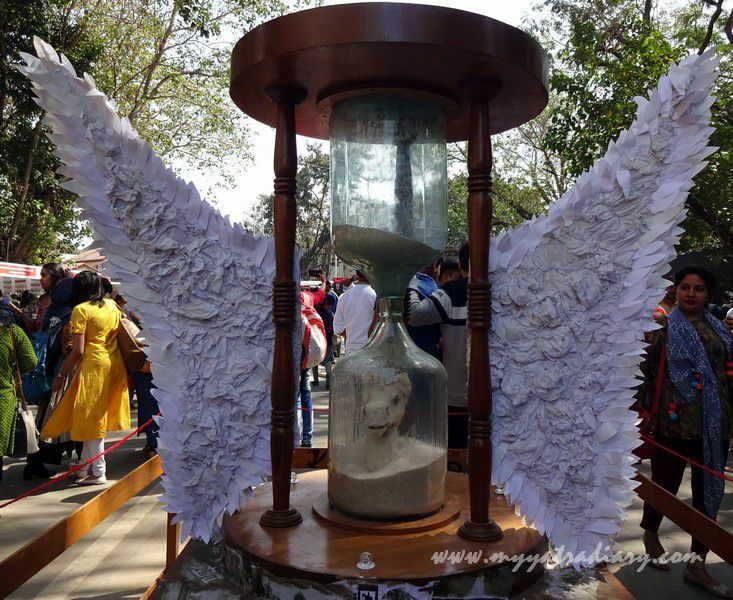 Nice post about Kala Ghoda arts festival. You gave all important info. What about food in the festival? Just curious! Good food also attracts lay visitors. The cloud of diamond, the kalipili ceilings, the colors...what an enthralling celebration of art! 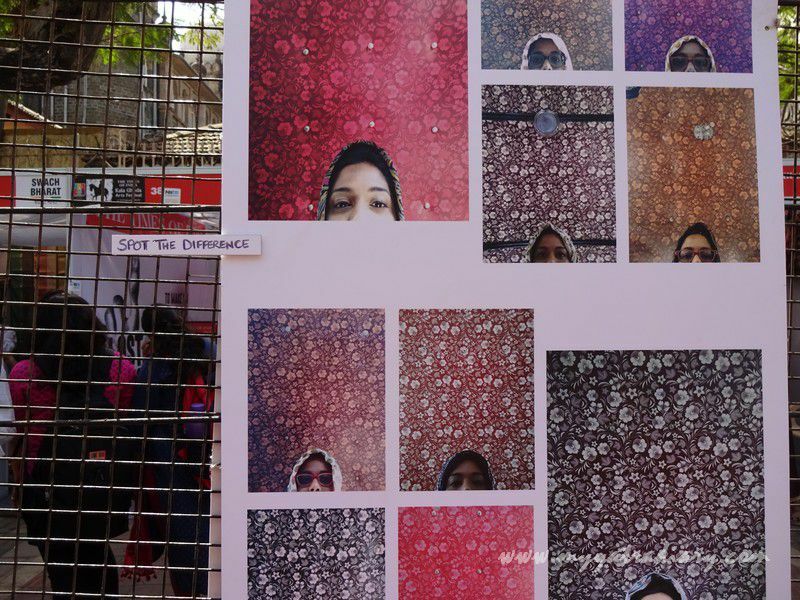 Thanks Arti for bringing the photographic view of KGAF for all of us. Wish to visit it since I have heard about it few years back. @Abhijit Ray: Good question! Though I did come across food stall while checking out these exhibits, I couldn't explore much of food in the festival this time around. Next time! @Mohini: Come to Mumbai, we will go together! Such cool exhibits. I'm sure it was great strolling through all of these. Lovely photographs I must say,increased my curiosity to a different level. I will definitely try to visit it next year. Wow! Amazing, colourful, thought provoking and so much more ... I loved some of these works of art.